With temperatures dropping and an increasing number of grey days, food begins to play an ever increasing role on our lives. 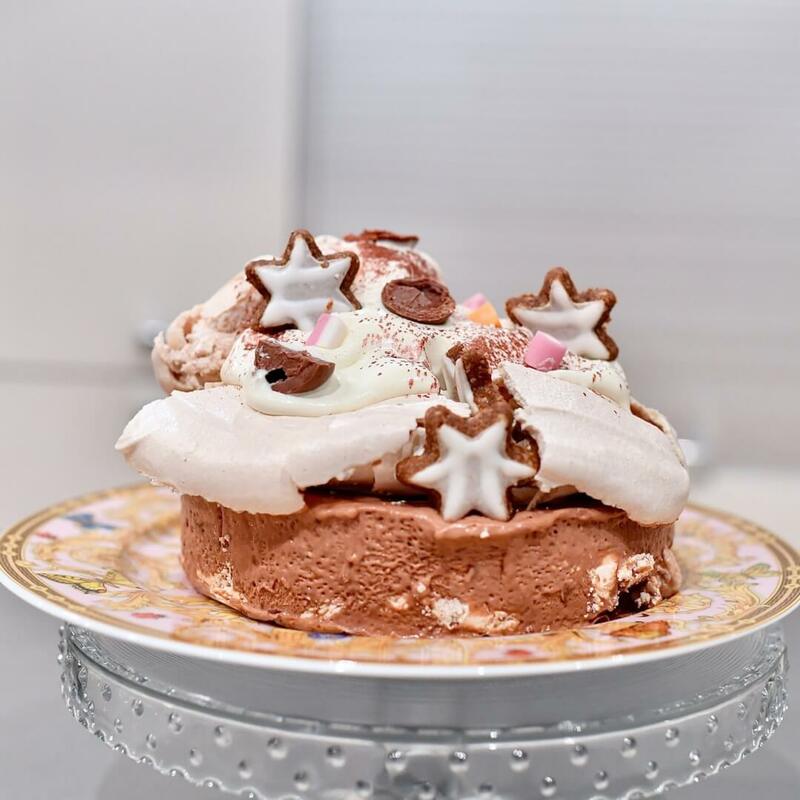 This multi layered frozen spiced pavlova is the perfect “make ahead” desert for the festive season. For a little extra fun leave the final decorating bit until your guests arrive. Let them join in on the fun. That’s how this desert got it’s topping. Lots of laughs and disputes about when enough is enough! Honest feedback from last night’s guests was that it tastes better than it looks! Trace 2 x18cm circles on baking paper. Whisk egg whites and pinch of salt to soft peaks. Then with motor running, slowly add the sugar and whisk until form and glossy. Whisk in vinegar, then fold in cornflour ad cinnamon. Spread 1/3 of the meringue over one circle and the remaining meringue over the other circle. Place in oven, reduce heat to 120° and bake for 1 & 1/2 hours. leave in oven with door closed until cool. For semifreddo, whisk egg yolks, sugar and brandy in a heatproof bowl over a pan of gently simmering water until mixture is thick and pale (6-7 minutes). Then take off heat and keep whisking for another 4-5 minutes until the mixture reaches room temperature. In a separate bowl whisk the creams to soft peaks. Fold the melted chocolates into the egg mixture and then add the whipped cream. 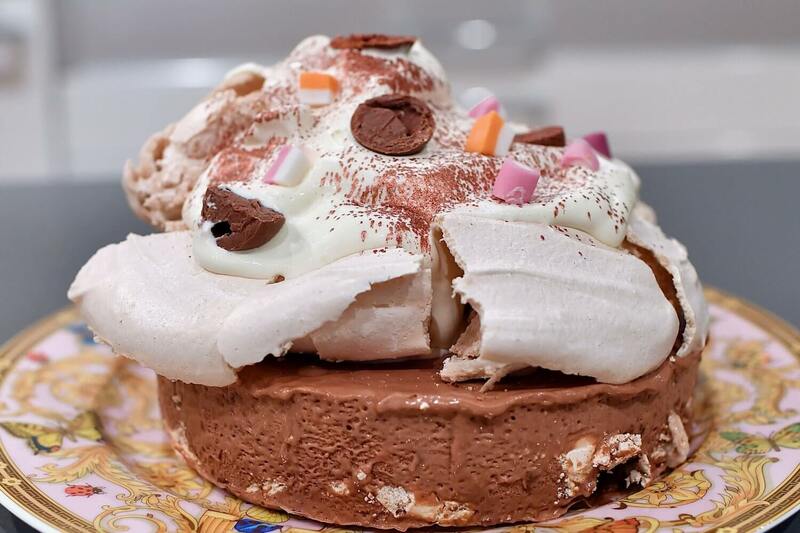 Place a flat meringue in a 22cm cake tin lined with baking paper. 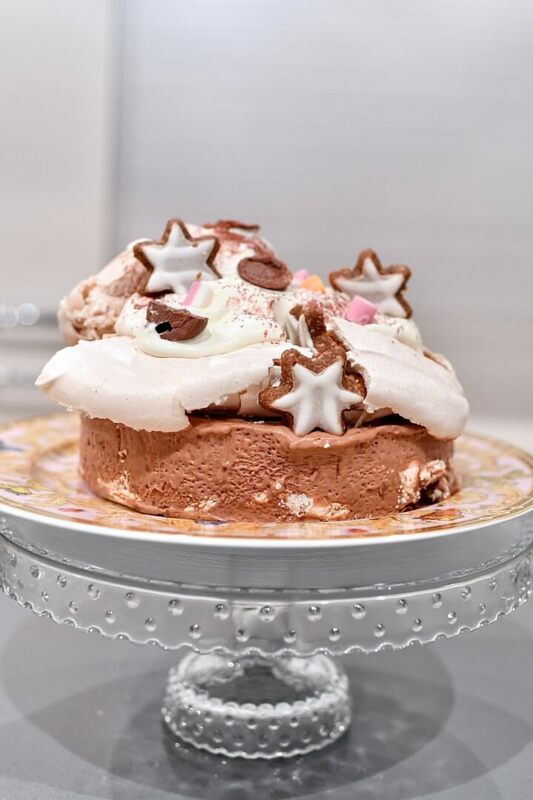 Spread semifreddo on top. Cover with clear foil and freeze overnight. Whisk cream to soft peaks, take semifreddo out of freezer. Run a hot knife around the edge of the tin and then remove from tin anyplace on serving plate. 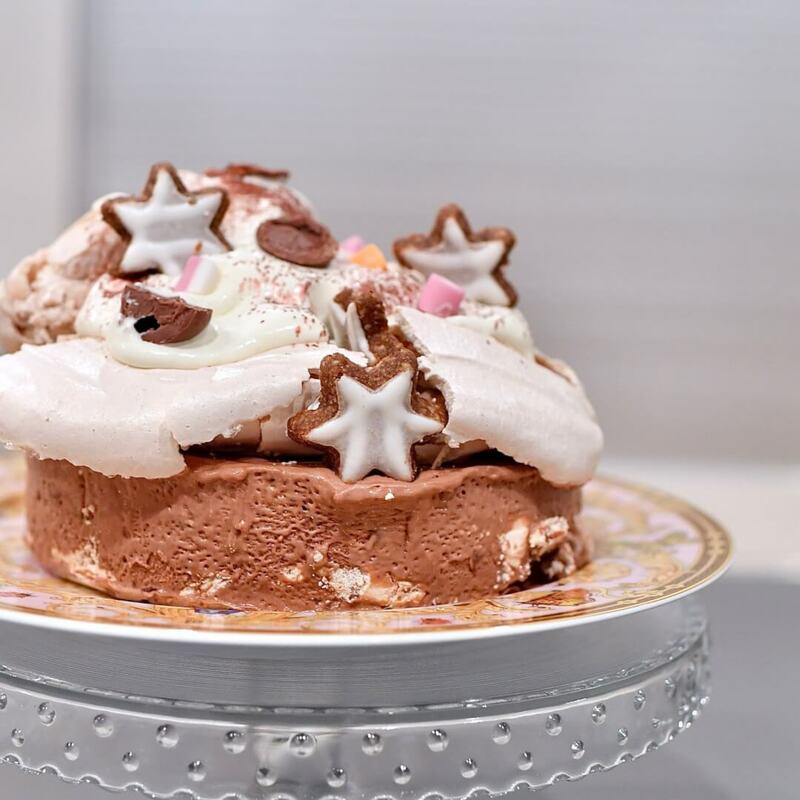 Place the remaining meringue on top, then cover with cream. Decorate with whatever looks like fun in your kitchen. I used gold powder, mint flavoured Lindt chocolate balls cut in half, dolly sweets and Christmas cookies.